Schererville, In - On Sunday February 3, 2008 the St. Sava School of Theology in Libertyville, Illinois solemnly celebrated their School Slava of St. Sava, the first archbishop, teacher and enlightener of the Serbian people. The host for this year’s celebration was the parish church-school congregation of St. George the Great Martyr in Schererville, Indiana. The Holy Hierarchical Divine Liturgy was officiated by His Eminence Metropolitan Christopher of Midwestern America and His Grace Bishop Dr. Mitrophan of Eastern America, assisted by the host pastor V. Rev. Dragoljub Popovic, Fr. Radovan Jakovljevic, Christian Education Director for the metropolitanate, Fr. Aleksandar Novakovic, Dean of Students and Protodeacon Stanimir Spasovic, a professor at the theological school and Secretary of the Metropolitanate. All theological students attended the liturgy together with two professors, Dr. Predrag Samardzic and Dr. Ruza Culic. The students joined the local church choir “Stefan Lastavica” and together with their learned church chant brought a truly holy atmosphere to the liturgy. During the small entrance His Eminence Metropolitan Christopher awarded the host pastor V. Rev. Dragoljub Popovic with the right to wear the pectoral cross as recognition for his many years of fruitful and dedicated work in the Lord’s Vineyard. His Grace Bishop Mitrophan delivered a powerful homily on the life and work of St. Sava along with the significance he had on Christianizing the Serbian Orthodox people. The newly elevated V. Rev. Stavrophor Dragoljub Popovic thanked His Eminence for the recognition given him, promising to continue, in the words of the Old Testament prophet, “my house and I will faithfully serve the Lord”. The clergy, together with the hierarchs, proceeded to the parish houses afterwards for some refreshments and then continued to the church hall where His Grace Bishop Mitrophan officiated at the Cutting of the Slava Kolach, prepared by sister Mira Kesic whom we especially thank. In the meantime, among the parishioners gathered in the hall taking part in this celebration were also parishioners from neighboring parishes together with their priests. Among the visiting clergy were V. Rev. Luka Lukic, V. Rev. Lazar Kostur, V. Rev. Dr. Milos Vesin, Protonamesnik Dragan Petrovic, Fr. Marko Matic and Fr. Aleksandar Savic. A festive Slava banquet was served following this. Fr. 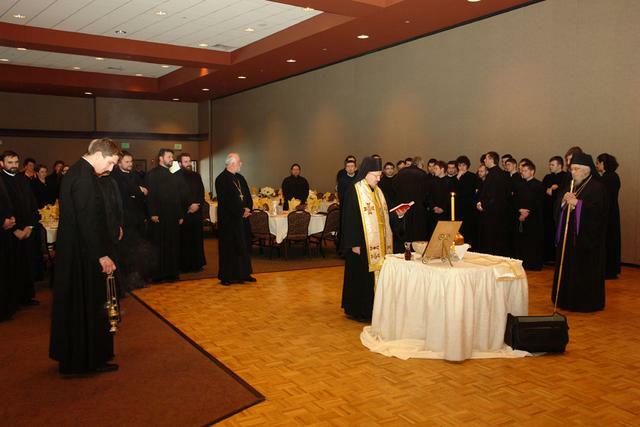 Dragoljub, having greeted the guests and introduced the head table, called upon V. Rev. Dr. Milos Vesin to resume the role of emcee for the afternoon program, which he authored. At the onset of the program the dean of the school, His Eminence Metropolitan Christopher, greeted all of those in attendance, thanked the host and spoke about the significance that this institution of higher education has, especially in North America. 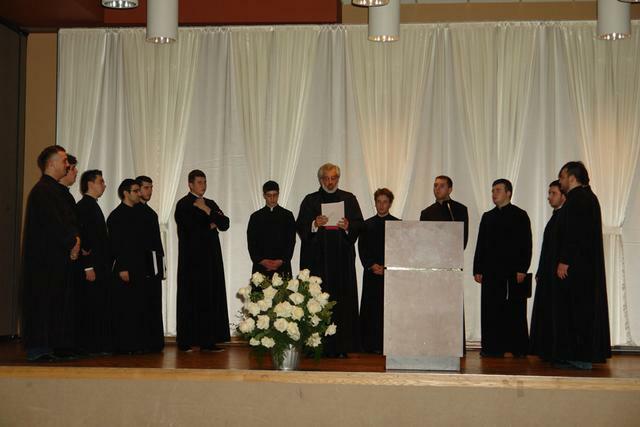 The program was very comprehensive, from readings of excerpts from the writings of St. Gregory and St. Sava, to reciting poems of a spiritual and nationalistic character, to choral pieces of beautiful church hymns from various composers to a solo performance by Fr. Milos. The program was well received by those in attendance. It was enriched all the more with the very talented Bozica Bozinovsky from Indianapolis, Indiana who performed one of her own compositions “Nostalgia” on the violin. Awards were given to the best and most active students at the end of the program. As in the past, Fr. Dragan Petrovic with his parishioners from Indianapolis presented each student with a monetary gift. The festive celebration ended with the Many Years sung to the newly elevated stavrophor V. Rev. Dragoljub Popovic, after which the thanksgiving prayer brought the program to a close. The writer of these lines is left to, once again, thank everyone for all things and especially to uplift prayers to the Triune God for the great gift to the Serbian people – St. Sava, to whom be glory and thanksgiving now and ever and unto the ages of ages.